Our story of Diego Ranch Inc. begins with a beautiful vision to unite the sentience of a horse with that of a person- a person suffering from mental, emotional, and physical impairment seeking a natural and powerful healing modality. Horses and humans are bonded through lineages since time immemorial. The ancient imprint humans have left on horses for use of: transportation, war, sport, and labor are linked to people and can actually serve as an incredible healing tool. At Diego Ranch Inc., our therapy program always emphasizes ‘what we can learn from horses is infinitely more valuable than what we can teach them.’ We use this motto to identify and address a range of emotional and behavioral challenges our clients struggle with on a daily basis. To shed some light on this, take for example the fact that a horse has the ability to read emotions as energy and communication, which compels the client to evaluate and change their emotional and mental state so they can harmoniously interact and handle the horse. This simple yet powerful mirroring effect has demonstrated positive and consistent results with our clients when mainstream medicine and pharmaceuticals have failed. Horses are also a powerful prey animal and have the capacity to use their senses and maintain their surroundings for survival, so they have a highly developed ability to react to subtle changes in our bodies or behavior. For horses, incongruity is linked to predator behavior - they can feel through our armor. In order to gain trust and connect with them, the armor has to come down. When we let down our armor, healing can begin. The founder of Diego Ranch Inc., Michael Jackson, deeply believes in our past, present and future kinship and connection to our equine friends and understand its healing power over humanity. “We have witnessed the impossible become the possible. Children and adults lacking physical mobility are gaining muscle function and movement, while other clients who have never spoken a single word in their entire life are now verbal! This is huge! It is incredibly rewarding to experience this on a daily basis!” Michael and Jennifer began their relationship and business partnership through their shared passion and love for horses. Understanding the magic that horses hold in uniting and healing people, set into motion the foundation of Diego Ranch Inc.
We strive to empower people with physical and developmental challenges to discover their greatest strengths and gain a sense of self-confidence and self-reliance through the special relationship with a horse in a safe environment. ​~ Our primary objective is equine therapy- the use of horses to heal children and adults struggling with mental, emotional, and behavioral health issues such as: substance abuse, addiction, behavior disorders, mood disorders, eating disorders, learning differences, ADD/ADHD, autism, Asperger’s, grief/loss, trauma, PTSD, bipolar, depression and much more. ~ Allowing individuals to develop needed skills and attributes to handle and ride a horse leads to the unfoldment of accountability, responsibility, self-confidence, problem solving skills and self-control. Our equine therapy program will provide an innovative milieu in which a therapist and patient can identify and address a range of emotional and behavioral challenges. ~ Many benefits are likely due to the nature of the horses with which patient and equine therapist are interacting. Horses are non-judgmental, have no preconceived expectations or motives, and are highly effective at mirroring attitudes and behaviors of humans with whom they are working with. This unique and effective form of alternative therapy is something you can’t find with mainstream medicine or in a doctor’s office. ~ Additional services will be offered by Diego Ranch Inc. to promote and sustain our non-profit financially. The facility will offer lessons and instruction to ensure proper skill sets for the safety and education for individuals wanting to learn how to ride and work with horses. Safe and daily maintained accommodations for individuals unable to lodge their own horses will be available as well as natural horsemanship training for horses on all levels of experience. The facility will also provide a one of a kind obstacle course to challenge and advance the riders skill and technique. Other equine related activities, workshops, lectures, demonstrations, and collaborations involving FFA, 4-H, Pro-Rodeo Circuit, PATH, and similar organizations seeking to bring awareness and understanding of animals and horses to the public will be actively involved and affiliated with Diego Ranch Inc.
107.9 KFIN, Caraway General Store, Arkansas Trailer, Teresa Boyd, 95.9 The Wolf, Walker Equipment, Miracle Kids Success Academy, Joey Glaub Photography, AR Care, Watson Ice, and 101.7 KISS FM. Please feel free to follow us on Facebook and Instagram or email us at diegoranchinc@gmail.com for additional information. INVEST IN PEOPLE WITH NEEDS. People are now starting to see the healing benefits of equine therapy and how horses can make a positive impact on children and adults struggling with mental, physical, emotional and behavioral health issues. Horses are non-judgmental and have no preconceived expectations or motives, so they can be highly effective with helping individuals develop needed skills and attributes such as accountability, responsibility, self-confidence, problem-solving skills and self-control to overcome their particular health concerns. Our community has helped us out tremendously in supporting our vision and future plans for Diego Ranch Inc., and we plan on returning this act of kindness by expanding our facility so we can outfit the Northeast AR District Fair, Pro-Rodeo Circuit, FFA, 4-H, Horsemanship workshops, PATH lectures, demonstrations and so much more. Bringing awareness and understanding of horses to the public and offering a one of a kind therapy program is our way of giving back to the people. We live in a time of constant technological change, and this has made a huge impact on our lifestyle and health. Diego Ranch Inc. strives to create an environment in which people can disconnect from their electronic devices and re-establish their roots in nature and with animals. We believe that true healing begins in the outdoors, while in the company of skilled therapists, both human and non-human. 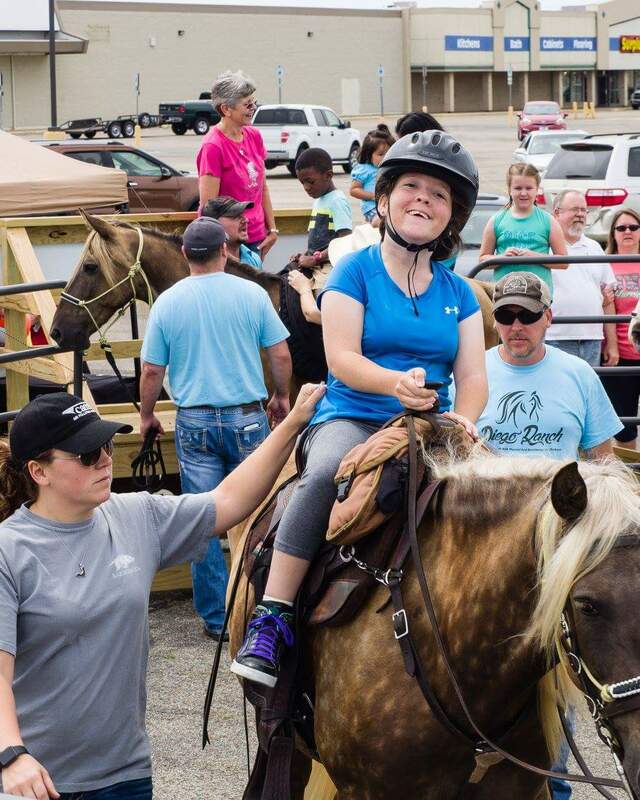 Our riding facility and therapy program can offer this and so much more with the help of our horseback riding community. Currently, we are trying to meet the needs of a few objectives that will take our non-profit organization to the next level of completion. Our major focus is acquiring enough property to sustain a large, environmentally safe facility which includes: stalls/paddocks, indoor & outdoor riding arena, classroom, office, observatory, storage, pastures, round pin, outdoor obstacle course, and trails. Our objective is to find grant writers, sponsors, and charitable donors. 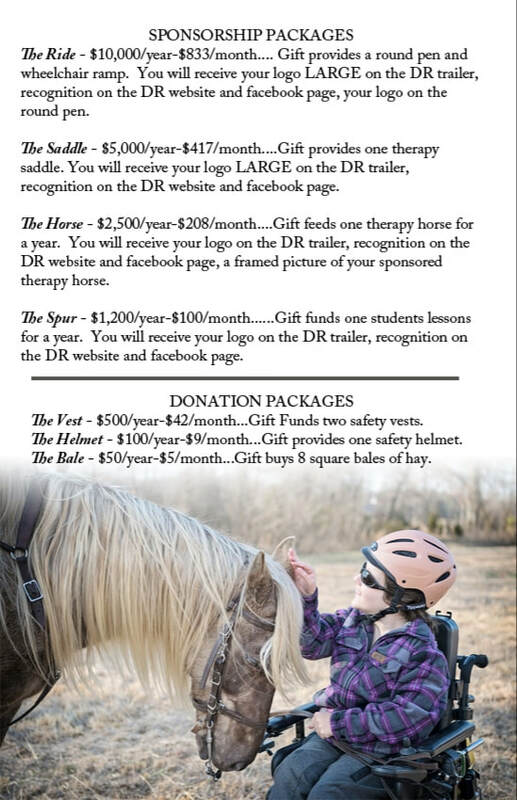 We would like to challenge all like-minded individuals out there who want to make a positive change in our world, by supporting our equine therapy program, and making a contribution of any kind so our facility can expand and better accommodate our growing clientele. ​Diego Ranch Inc. is a 501(c)3 nonprofit, all donations are tax deductible to the fullest. So saddle up and bring hope, joy and unlimited possibilities through the healing power of the horse.